From: DICTIONARY OF AMERICAN NAVAL FIGHTING SHIPS Vol. VII pp. 394-95. Ulysses Simpson Grant-born on 27 April 1822 at Point Pleasant Ohio-graduated from the United States Military Academy on 1 July 1843. He served with distinction in the war with Mexico-under Generals Zachary Taylor and Winfield Scott taking part in the ba ttles of Resaca de la Palma Palo Alto Monterrey and Vera Cruz. He was twice breveted for bravery: at Molino del Rey and Chapultepec. After growing restive during frontier duty in the peacetime Army he resigned his commission in 1854 and attempted to p ursue careers in business and farming. Shortly after the outbreak of the Civil War Grant was commissioned a colonel in the 21st Illinois Volunteer Infantry. He later became brigadier general of volunteers on 7 August 1861. Following the captures of Fort Henry and Fort Donelson in February 186 2 President Abraham Lincoln promoted Grant to major general of volunteers. These victories opened Tennessee to federal forces and earned Grant the nickname of "unconditional surrender." He doggedly pursued the Confederate Army and won impressive-but costly-victories at Shiloh Vicksburg and Chattanooga. His willingness to fight and ability to win impressed President Lincoln who appointed Grant lieutenant general and gave him overall comm and of the Army. his headquarters to Virginia where he turned his attention to the long frustrated Union effort to take Richmond. Despite heavy losses and difficult terrain the Army of the Potomac kept up a relentless pursuit of General Robert E. Lee's troops and won blo ody contests in the Wilderness at Spotsylvania at Cold Harbor and at Petersburg. His relentless pressure finally forced Lee to evacuate Richmond early in April 1865 and forced him to surrender at Appomattox Courthouse on 9 April 1865. Within a few week s the War between the States was over. Grant became ad interim Secretary of War on 12 August 1867-when Johnson suspended Secretary Stanton-and held the office until early the next year. He ran for the presidency on the Republican ticket in 1868 and won the election. His two terms were marred by economic social and political turmoil but Grant himself was not involved in the scandals and his personal reputation emerged untarnished. He devoted his twilight years to writing and completing his two volumes of Personal Memoirs which were published the year of his death. Grant died on 23 July 1885 at Mt. McGregor N.Y.
Ulysses S. Grant (SSBN-631) was laid down on 18 August 1962 at Groton Conn. by the Electric Boat Div. of the General Dynamics Corp.; launched on 2 November 1963; sponsored by Mrs. David W. Griffiths the great-granddaughter of Gene ral Grant and was commissioned at Groton on 17 July 1964 Capt. J. L. From Jr. in command. Following shakedown the fleet ballistic missile (FBM) submarine got underway from Groton in early December 1964 bound for the Pacific. Transiting the Panama Canal on New Year's Eve she arrived at Pearl Harbor in January 1965. 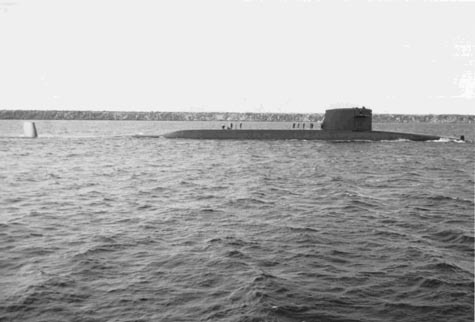 The FBM submarine was depl oyed to Guam in the Marianas and operated from there into 1970. She conducted 18 deterrent patrols before returning to the east coast of the United States departing the western Pacific in December 1970. After an overhaul at Charleston S.C. Ulysses S. Grant was deployed to Holy Loch Scotland and operated in the European area until September 1975. Returning home at that time the submarine continued to operate with the Atlantic Fleet on deterrent patrols into 1980.